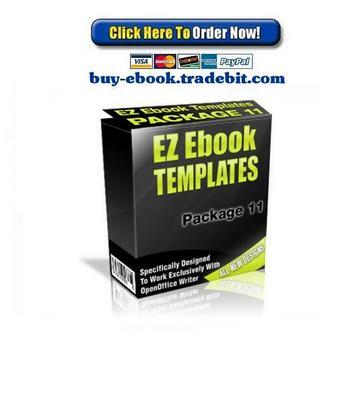 The consensus is in....People love EZ Ebook Templates! They love using them. And, they love how E-Z it is to generate professional looking PDF ebooks or special reports without all the brain-busting work involved trying to churn out new designs themselves. Many others have tried to duplicate what we do, but fall just a wee bit short when it comes to striking design layouts. And with our newest collection, finding the right design is but a few mouse clicks away! *NEW! * - Each Ebook Template Comes With Its Very Own Sample Resell Rights Page And Legal Disclaimers Page, So Thats 2 Extra Pages Inside! Now, if you need some type of extra-super-hyped-up-exclusive bonus collection of crappy products to justify your purchase today, forget it! This package is worth much more than the price I am offering it at.